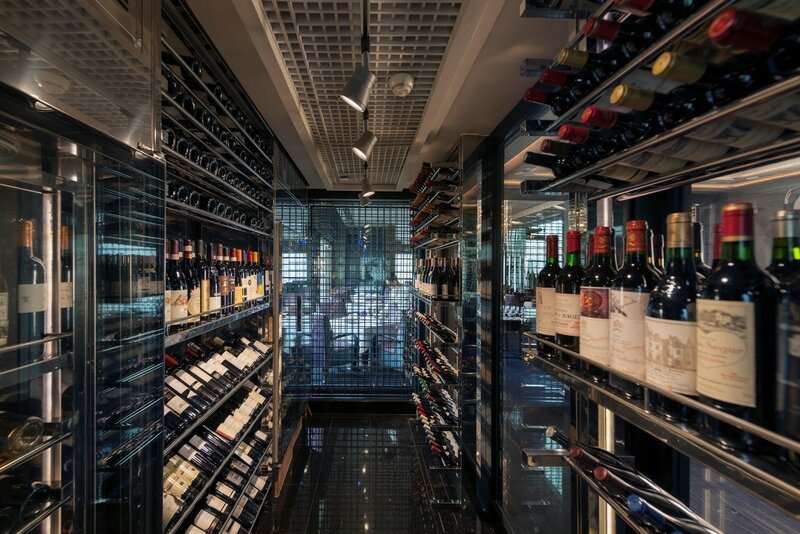 In the decade since Hong Kong eliminated import duty on alcohol, the city’s wine scene has flourished; today you’ll find lists peppered with classic options from Burgundy as well as biodynamic wines, Italian varietals and bottles from China. You can also settle into a stool at some of the craftiest cocktail lounges around the globe. Here’s where to sip on your next sojourn in the Asian port city. You don’t even need to wait until you arrive to start swirling and sniffing. Cathay Pacific recently launched a new route from Washington Dulles to Hong Kong on the Airbus A-350, opening it up to a much wider swath of visitors. In business class, attendants pop Piper-Heidsieck NV Brut and uncork mineral-driven South African chardonnay from De Wetshof Estate and lush cabernet sauvignon from renowned Argentinean producer Catena Zapata. The Oriental Breeze is a zero-proof libation with sour plum tea, cranberry juice, honey, lemon and rose water; add a shot of gin and it becomes the perfect aperitif to kick off that 14-hour flight. You’ll get a memorable drink at any of the ten restaurants and bars at the Mandarin Oriental, the luxe brand’s flagship property. Many of them happen to be on the 25th floor, so your Vesper comes with a Victoria Harbour view. The two Michelin-starred Pierre is namesake chef Pierre Gagnaire’s Hong Kong outpost, where head sommelier Hubert Chabot deftly pairs dishes with (mostly) French bottles. Select the prix fixe lunch menu and let Chabot thrill you with pours that cozy up to the menu, which skews modern French with a smattering of international flavors. Next door, one Michelin-starred Man Wah Cantonese and regional specialties. Reserve a table after sunset, when the gold lanterns reflecting on the windows give the illusion that they are floating in the night sky. A Set Menu might partner work-fried Wagyu, fresh lily bulb and green peppercorns with a surprise like the 1999 Château Musar, a grippy red blend from Lebanon’s Bekaa Valley. Take a ride on the Star Ferry to Kowloon to dine at Yan Toh Heen, the signature restaurant at the Intercontinental Hotel Hong Kong which flaunts two Michelin stars, jade accents through and a front seat harbour view (the resto’s name translates to “appreciate the view.”) Golden crabmeat-stuffed crab shell and dim sum dishes like lobster dumplings and baked roast duck and taro buns are among the specialities; standouts on the hefty wine list are the pages of Chinese wine: Huangjiu (matured Chinese rice wine), Shaoxing (matured Chinese yellow rice wine) and 13 still and sparkling Chinese table wines made with riesling, chardonnay and cabernet sauvignon. Some experts deem China the next hot wine region; a three-pour tasting gives a great intro to the country’s potential. The Intercontinental’s Lobby Lounge offers #852Tails of Hong Kong. Named for the city’s area code, these fourteen cocktails are a mix of local ingredients, historical anecdotes from both British and Chinese rule and pop culture. Tea Time is inspired by the pineapple bun, named in 2014 as an intangible part of the HK’s cultural history; the Sai Yeung Choi Street has watercress, citrus, local honey and Champagne and looks back at a district in Kowloon once known for watercress cultivation. Cristobal Huneeus is turning Hong Kong into a natural wine town. The owner of La Cabane knows his battle is as steep as the streets in the Central neighborhood where his wine bistro is located: ween Hongkongers off the usual Bordeaux, Bordeaux and Piedmont bottles that have long filled wine lists and shelves, and onto funky varietals and less expected regions. He's doing just that there and at his nearby wine cellar, offering artisan bottles that are biodynamic, organic or made with minimal manipulation. Order a méthode ancestrale bubbly, skin contact wine or the mystery option with boudin noir burgers; if Huneeus is there, buy the well-connected oenophile a glass and pick his brain. Down an nondescript alley, The Old Man is Hong Kong’s can’t miss-spot for elevated cocktails (and was awarded the number 10 ranking in 2018’s list of World’s Best Bars.) Created by industry vets Agung Prabowo, James Tamang and Roman Ghale, the bar is an ode to the works of Ernest Hemingway, from the cubist inlaid portrait of the author next to the molecular mixology tools bartenders wield to the drinks’ names. The Sun Also Rises stirs copra fat-washed applejack with rotovap fresh curry gin, sweet vermouth sous-vided with pandan leaves and makrut lime; A Moveable Feast is the minimalist answer to a Bloody Mary, with sea water-infused spirit, clear spiced cherry tomato, coconut, basil-tomato leaves and oyster leaf. And the bar top? Prabowo installed a custom-made strip that runs its entire length that’s chilled by dry ice, eliminating the need for wasteful coasters or cocktail napkins. The Old Man only has 29 seats and doesn’t accept reservations, so plan on getting there early or waiting a long time--but it’s worth it. Founder and managing director Tori Chow takes a culinary and seasonal approach to her drinks at The Woods scouring the market across the street to source ingredients for her original creations. The eight seats at the reservation-only experimental bar are where you can sip Good Riddance, with fino sherry, HIne VSOP Cognac, papaya shrub and orange bitters; adjacent cozy tables are open to walk-ins. Chow’s take on the Negroni infuses gin with beetroot and stirs it with Dolin Rosso Vermouth and Campari, and her Tom Yum shot is a stand-in for the spicy Thai soup, with lemongrass syrup, makrut lime vodka and chilis.